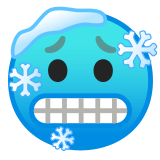 🥶 This emoticon demonstrates that you are so cold that you turn blue and covered with frost, and your teeth are tapping the drum roll - all it means that you are frozen to death. All you dreams is to get a warm place as fast as possible and have a cup of hot tea, or maybe even take a hot bath. Perhaps there is someone who can replace all this only with his ardent embrace? 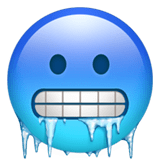 Cold Face Emoji was approved as part of Unicode 11.0 standard in 2018 with a U+1F976 codepoint, and currently is listed in 😀 Smileys & Emotion category. 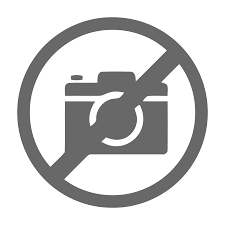 Use symbol 🥶 to copy and paste Cold Face Emoji or &#129398; code for HTML. This emoji is a pretty new emoji and it's support may be limited on older devices. You can get similar and related emoji at the bottom of this page.